Dr. Rafael E. Yanez, a dentist in Philadelphia, seeks to make the entire dental experience one that patients look forward to. With this goal in mind, he teamed up with Rosemont Media to update his practice website to include the sort of amenities that individuals respond to most. The newly launched dental website design for I.Dentical – All About Your Smile features detailed procedural information, an appealing, modern layout, and a responsive format that makes mobile browsing easier and more enjoyable than ever. Developed with both traditional desktop computer and mobile users in mind, the site was built with a responsive design that automatically adjusts the web pages to fit any size screen, big, small, or in between. Furthermore, individuals with Internet-compatible smartphones, laptops, and tablets can now seamlessly connect to the site from virtually any location. For Dr. Yanez, unlimited access was just the beginning. The website also showcases a plethora of leading design features, including a fixed-image background of the office on the homepage, a series of video testimonials, and a Google office tour that familiarizes new patients with the practice. As people who are well informed are typically more satisfied with their treatment, the website also includes comprehensive information on cosmetic, general, and restorative dental procedures. To aid current and prospective patients in locating Dr. Yanez’s website, Rosemont outfitted the site with leading dental SEO strategies, which help to position the practice favorably in its online marketplace. Elevated placement on search result pages helps set Dr. Yanez apart from his competition initially, and his extensive training, exceptional service, and state-of-the-art technology ensures that individuals will seek him out for dental care for years to come. 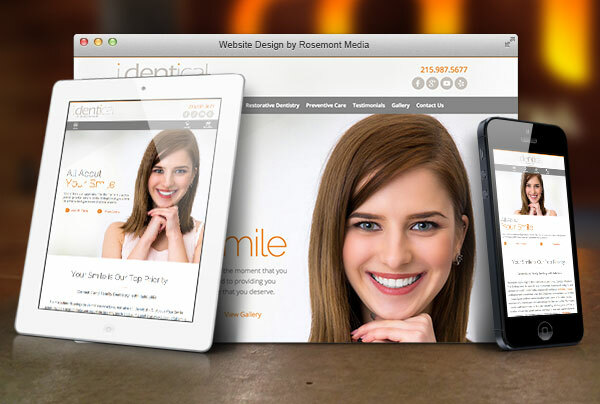 To view an example of a customized dental website designed by Rosemont Media, please visit dentist-philadelphia.com. To learn more about what we can do to enhance your practice site, please contact us today.